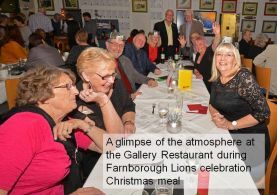 Farnborough Lions Club members enjoy a wide variety of social activities which includes the 2018 Christmas Celebration Meal, illustrated here. 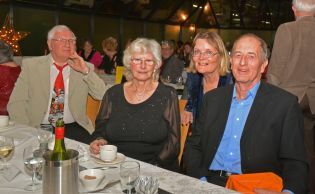 The Lions and their wives and husbands enjoyed a superb choice of food at the Gallery Restaurant at Farnborough College of Technology. Served by final year students on the hospitality courses we were very fortunate to benefit from the tremendous talent of the young people in our area for our enjoyment. 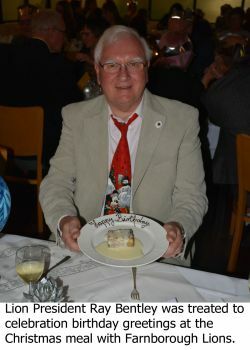 It was double celebration at the Christmas Meal with Lion President Ray Bentley celebrating his birthday that day. This is just one example of how Farnborough Lions enjoy ourselves. Other social events have included trips to Chatham Historic Dockyard where they film the TV series 'Call the Midwife', a tour of Bletchley Park the home of the top secret intelligence centre in World War 2, ten pin bowling challenges against neighbouring Lions Clubs, summer barbecues and restaurant theme nights. Plans for 2019 include a visit to the Bombay Sapphire Gin Distillery, a mystery tour with a local tour company and a Trivia Night. 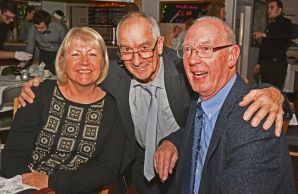 If you would like to find out more about how Farnborough Lions enjoy a good social life alongside helping others in the community, locally and further afield call our contact number below (local rates apply) or Click Here to ask for further details by email.